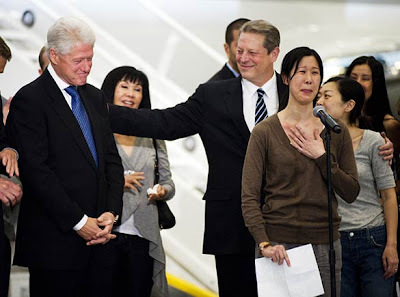 The statement below by Al Gore has been recently added on the Current TV website. Current had to take a vow of silence during this harrowing ordeal in able to pursue negotiations with North Korea. A video series of all the work that Ling and Lee acquired prior to being imprisoned in North Korea is also now showing on the site. CLICK HERE to watch. 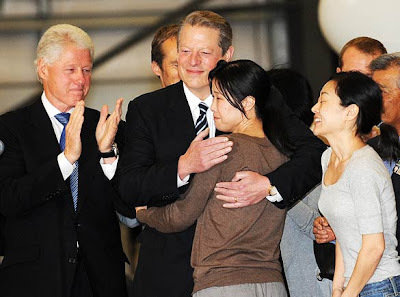 Current Media journalists, Laura Ling and Euna Lee, who have been detained in North Korea since March 17th, will be coming home on Wednesday morning with former President Bill Clinton, who is at this moment returning from North Korea having obtained their release. We want to thank the Obama Administration for its continuous and determined efforts to achieve this outcome, and President Clinton for his willingness to undertake this mission. All of us at Current are overjoyed at Laura and Euna’s safe return. Our hearts go out to them – and to their families – for persevering through this horrible experience. We will have more to say in the days and weeks ahead. But for now, all our thoughts are with Laura and Euna and their families, who have shown remarkable courage and initiative for the 140 days of this ordeal.